NON MEDICAL INGREDIENTS : Microcristalline Cellulose, Magnesium Stéarate, Gelatine. Dear sir, only 45 minutes before your relation, take 1 to 2 Koloss capsule and therefore guarantee a maximum of pleasure for you and a greater satisfaction for your partner. 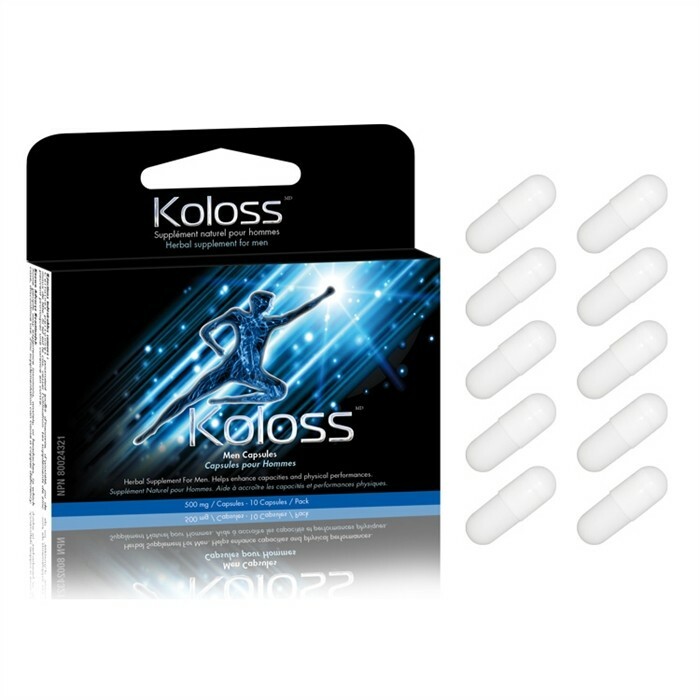 It has taken two years of development to finally reach our goal…offering you the Koloss sexual capsules…a reliable and high quality aphrodisiac. Koloss has been approved by Health Canada and was attributed a Health product approval number #80024321, so the Koloss capsules are totally safe. 8 natural ingredients carefully balanced between them, assure a winning recipe for man. Be ready for remarkable sexual feats with more desire, better erections, more energy and for a longer period of time. The aphrodisiac Koloss capsules are available in packages of 2 capsules or packages of 10 capsules.